I’m not sure which came first, his fear or mine. We were standing there, his sweaty hand wrapped around my dry one, his head cocked slightly to the left as he began to lean in for our first kiss (to hell with his mother’s opinion of me). Screams erupted behind us, just beyond the wooded path we had traveled moments before and we both jumped and screamed in response, the romantic moment totally wrecked of course. These parts were known for creepy, unexplained happenings (like deaths and stuff), which is why we had chosen to come to this exact spot; we wanted to reenact one of the murders, minus the dying part of course, and it was all supposed to have started with a kiss. Now we were totally freaked out and shaking—the only way back to the car blocked by the screaming—until a young naked, shrieking couple emerged, shivering and muddy; the sudden downpour having rudely interrupted their activities. 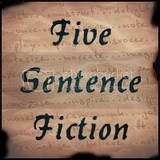 —Five Sentence Fiction, of Lillie McFerrin fame, offered up “rain” as this week’s writing challenge.